Hi! It’s Sunday and it’s snowing. Mother Nature! 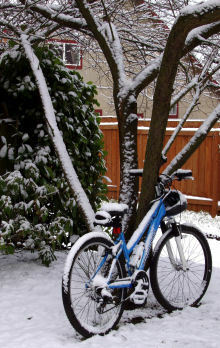 How many times do I have to tell you: IT DOESN’T SNOW IN PORTLAND. Good grief. You listen to direction about as well as my daughter. Well, fresh snow on branches really *IS* beautiful. And this snow will probably be melted in 24 hours. And it gives me an excuse to keep the fire going and use up that blown-down debris that Miss T and I collected on Monday.